The Cowboy Outlaw hand operated leather stitcher is the finest machine of its type in the market today. Carrying on the legacy of fine hand craftsmanship that defined the American West, the Cowboy Outlaw hand stitcher has proven itself to be an indispensable tool to leather workers the world over. Each pull of the handle delivers a clean, precise lockstitch, allowing the operator total control of stitch placement. The Outlaw uses some of the heaviest thread available allowing the user to create finely handcrafted leather items of true distinction and character. Durability is a hallmark of this precision leather sewing machine. With all cast iron construction and solid heat treated steel parts inside, the Outlaw is a far better alternative to other machines in the same class. 1. Solid cast iron outer casting provides durability and weight. 2. A true 9 inches of usable space to the right of the needle allows the operator to fit large items into the arm of the machine. 3. Class leading hook design makes for far less skipped stitches. 4. Larger hook and bobbins allows for less bobbin changes. Same hook as used in motorized professional machines. 5. Titanium nitride coated hook, shuttle race and shuttle cover allows for a durable protective finish. 6. Industry first bobbin case cover provides protection against possible injury while operating the machine. 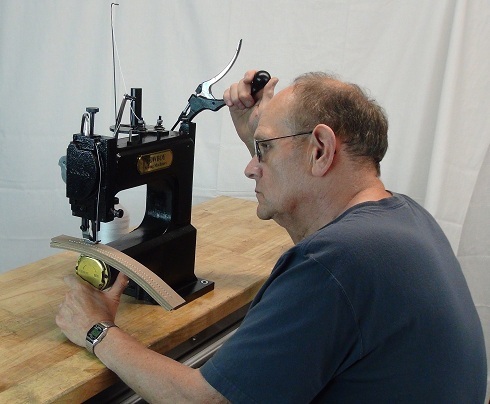 Try the Cowboy Outlaw hand crank leather sewing machine and make this quality tool a part of your workbench today!! !